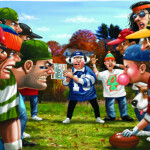 Thought I would share with my family and friends Jason Gray’s fourth edition of his rules of the annual family Thanksgiving football game. He brings us 26 (more) this year beginning with, “Number 1: The… game speaks a universal human truth: There’s nothing we enjoy more than getting together with the most important people in our lives. And, if they slip and fall down on the front lawn, face-first, that would be really hilarious.” You can read it here. Happy Thanksgiving everyone.